Creating a complete system image backup with Windows 10 can prevent the loss of system crash. AOMEI Backupper can save you from the dangerous situation easily. A system image is an exact copy of a drive. Generally speaking, a system image includes the drives required for Windows to run. And it also covers Windows and your system settings, programs and files. You can use a system image to completely restore your computer, settings and all in case of an unexpected disaster. Why create a system image backup? ●Computer fails at any point. You can reinstall your application by downloading the package, but it is an impossible task for you to restore your system, settings and data stored in your disk. ●Because you can not restore your system by simple copying and pasting your system data to another place, it is a necessity to create a system image backup. ●Since Windows 10 is newly released, we do not have adequate experience for the operation. If you have wrong manipulation, the system will be damaged. And it is hard to restore to the original if you do not have a backup. 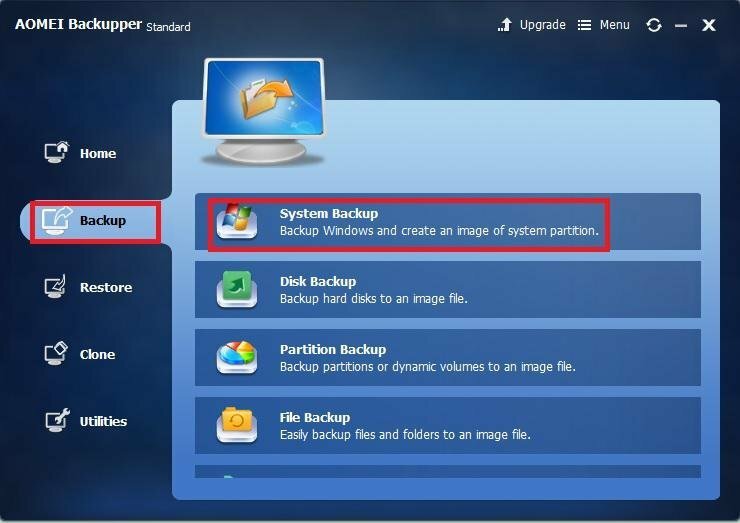 How to create a complete system image backup with Windows 10? Step1. Click Start, then select Control Panel and go to File History. Step2. Click System Image Backup at the bottom of the left panel. Step3. Choose the location of your system image backup, click Next. Confirm your settings and click Start Backup. 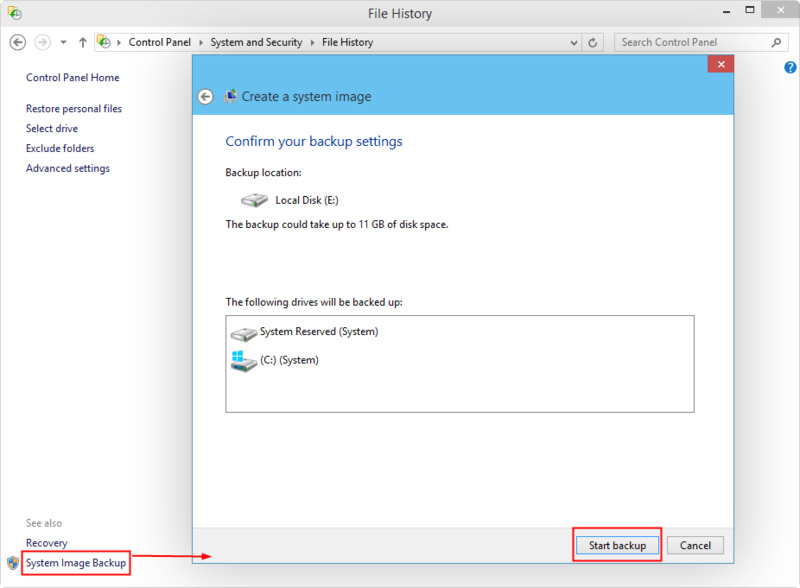 Tips: You can find it is complex and it is slow to create a system image backup using Windows 10 File History. We try to create a complete system image backup with Windows 10 File History. And we see the defects of it. So why not choose a better solution to creating a complete system image backup with Windows 10. AOMEI Backupper can create a complete system image backup with Windows 10 in an efficient way which is time-saving and energy-saving. And it is an easy use backup software for a freshman. What’s more, you can backup your system without paying for it. So AOMEI Backupper can be the best choice for creating a system image backup with Windows 10. Now let me show you the detail of the operation. We backup Windows 10 to NAS. Step1. Download AOMEI Backupper, install and Launch it. 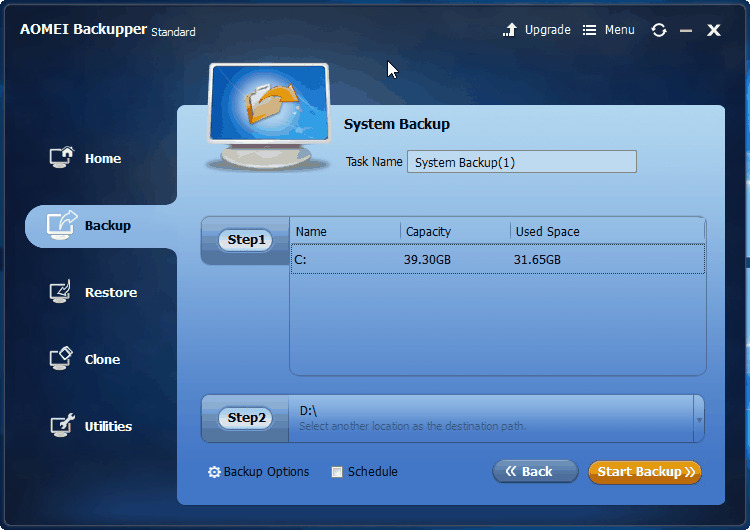 Click System Backup under the Backup option. Step2. In the default situation, backup your system is to backup your C drive. Step3. ClickStep2 to choose the location. Click Share\NAS in the pop up window. Step4. 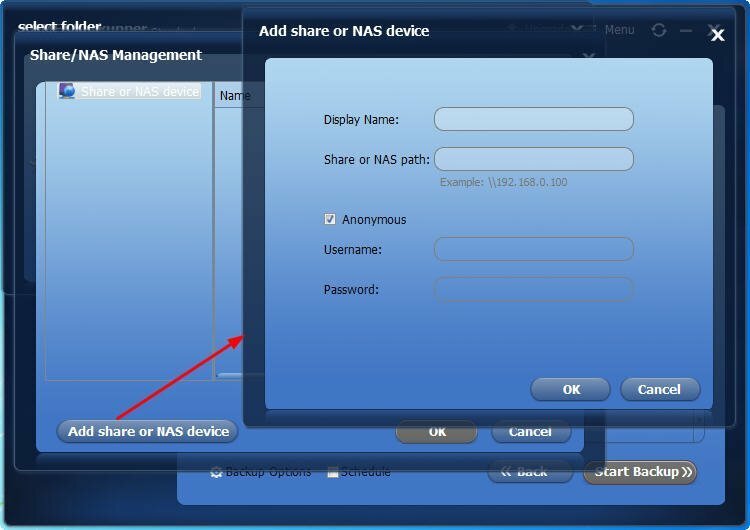 ClickAdd share or NAS device, then input the IP address, username and password of your NAS which used to store your Windows system image backup. Check Anonymous to avoid inputting the username and password of NAS. Step4. Click Start Backup to begin the operation. ClickFinish to close the interface. ■ Confirm all the information of the NAS you inputted are correct, or you can not attach to your NAS. ■ Keep the local network which can attach to your NAS connecting. ■ You can not backup some files if you choose the Anonymous. AOMEI Backupper will prompt you if you can not backup. 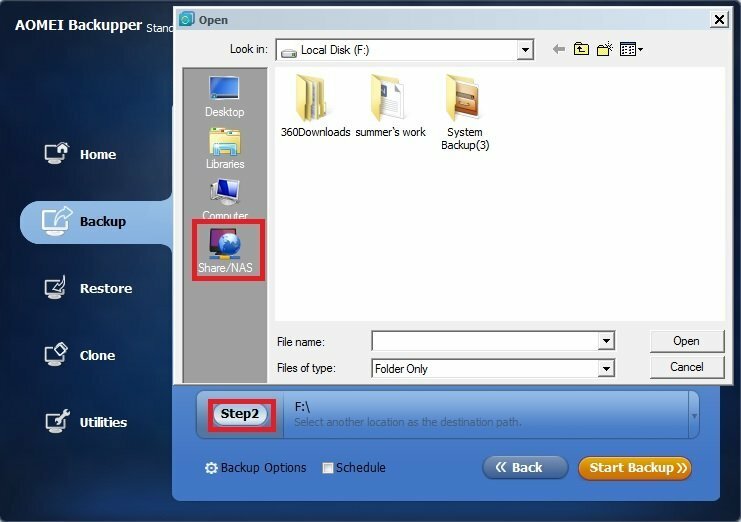 ■ You can restore from a system image backup with AOMEI Backupper.